If the upside to assigning a mechanic a keyword is visibility, it tends to exacerbate the issue of unnamed mechanics going largely unheralded. This was the lesson learned from Mercadian Masques, the set which famously had “no new mechanics” while still containing a number of areas of innovation in design. For Dragon’s Maze, this included an expanded role of the Guildgate cycle, and a new twist in terms of booster composition. In Return to Ravnica and Gatecrash, the first two sets of the block, the importance of Gates was hinted at but largely untapped. Return to Ravnica teased us with the Ogre Jailbreaker and Armory Guard, white Gatecrash gave every colour a card that mechanically interacted with the Gates. With Dragon’s Maze, however, we finally were granted a full cycle of creatures- the Gatekeepers- with a slight twist. Rather than needing only one Gate in play to activate their extra power, they needed two. The upside, of course, was a greater level of power, with a different spell-like effect being granted for free when the creature was played. The Ubul Sar Gatekeepers offer a free Disfigure, for instance, while the Smelt-Ward ones bring along an Act of Treason. Another twist to the set came in the composition of its booster packs. Although land cards have been a fixture of boosters for a time now, Dragon’s Maze doubled down on the land commitment by offering Guildgates and rare “shocklands” in the pack’s land slot, with the change of a mythic rare Maze’s End. Although this wasn’t the first time it was possible to get three mythics in a single booster pack (Dark Ascension’s Huntmaster of the Fells and Innistrad’s Garruk Relentless beat Dragon’s Maze to the punch), having a land-only extra mythic slot certainly serves as a mark of distinction. The Guildgates, too, got a bit of a makeover, with new, panoramic-art versions appearing to complement their earlier incarnations. Indeed, this focus on the land conveying the flavour of the set has its roots as far back as the “land matters” set of Zendikar. While the “full art” lands made quite a visual impact, Wizards subtly conveyed the Phyrexian takeover of Mirrodin in the next block through the gradual transformation of basic lands throughout each of the three sets. Innistrad did something similar, with the “darker” basic lands of the first set getting a lightening-up for the basics of Avacyn Restored. Although the alternate-art Gates are an innovation, they’re part of a growing trend at the same time. While it’s good to appreciate the range of development and innovation in a set, today’s guild is one that is fairly resistant to change. What else might you expect from one led by a council of spirits, the ghosts of those who have outlived their mortal shells? Our deck today is Orzhov Power, the second coming of the Syndicate. The deck opens with a a number of early extort options in the two-drop slot, to cement that crucial early-game advantage. Basilica Screecher is a familiar face we saw the first time around, a 1/2 flier getting in for damage in the air. It has a match this time with the Tithe Drinker, which inverts its power/toughness ratio and swaps flying for lifelink. That gives you a full playset of extort creatures amongst your two-drops, but you also get a trio of Bane Alley Blackguards. These are a most interesting card, since we’ve only recently been given an efficient two-drop for Black in the Walking Corpse. In fact, a 1/3 is much more useful to this deck’s aims than a 2/2, helping you stall for time while you develop your board position. Moving on to the deck’s three-drops, we find some other welcome returners in the Kingpin’s Pet and Basilica Guards. These further the aims of the deck that we’ve already established with the Screecher and Blackguards, namely to congest the red zone while going for damage above it. Dragon’s Maze offers another new addition in the form of the Sin Collector. This Human Cleric is a bit of a deviation from the linear trajectory on offer thus far, as it neither has extort nor contributes much in the way of creature combat. Instead, this is disruption, pure and simple. It differs from the most common forms of Black discard in that it actually exiles the targeted card, which is the White influence at work. Although that’s not as relevant in the Return to Ravnica environment as it is in the Innistrad one (thanks to flashback), it’s still a welcome effect. The four-drops offer further evidence that this deck is happy to range quite far afield from Orzhov Oppression. The first rare appears here in the form of the Crypt Ghast, from Gatecrash. In addition to the requisite extort, the Ghast also acts as a mana doubler for your Swamps. Though this isn’t as poweful here as it might be in a mono-Black deck, it’s still quite powerful n a deck where the top of the mana curve is the most populated slot. Next up are the Ubul Sar Gatekeepers, which give you the opportunity to two-for-one your opponent if you’ve managed to find two of your Orzhov Guildgates. Although -2/-2 won’t take care of everything, it can pick off a smaller creature on its own or take down a larger one if its sustained combat damage. In this environment, any removal at all gets a warm welcome. Finally, there’s a pair of Dark Revenants. 2/2 fliers that return to the top of your library when they die. That’s something of a mixed blessing, as a 2/2 flier for four mana isn’t the best deal in the world, and having to replay it only compounds the deficit over time. Finally, we arrive at the top of the mana curve, finding further evidence of the Orzhov’s drift in focus. The Bazaar Krovod is a good example of this, as it needs a home in a more aggressively-minded deck to reach its true potential. Not for nothing this card was actually contained in the Azorius Advance deck the first time around, and seems a bit of a misfit here. A bit more in line with the guild’s ethos is the Steeple Roc, a 3/1 with flying and first strike. The latter ability gives the Roc tremendous durability in the red zone, offsetting the fragility present in kin-cards Lyev Skyknight, Drakewing Krasis, and Daring Skyjek. Still, it’s five mana, and it’s important to recall that so many expensive spells have a negative synergy with extort. Next ups is Maw of the Obzedat, a five-mana 3/3. The Maw has a fairly useful combat ability, bestowing a +1/+1 blessing to all of your creatures- at the expense of one of them. This is a great way to finish off an opponent who’s on the ropes, since you can trade out your less offensively-minded offerings (like the Basilica Guards) to squeeze in that last bit of lethal damage. From there, we find the Smog Elemental, another holdover from Orzhov Oppression. The Smog Elemental synergises well with the deck’s air force, tamping down any opposition that might stand in their way. The last creature here is the deck’s foil rare, Teysa, Envoy of Ghosts. She’s an absolute powerhouse, and should often be able to all but win you the game outright if you can resolve here. Of course, that’s the rub- she costs seven mana. In the removal-light precon environment she’ll have few answers, though, and all but shuts down your opponent’s casual attacks by destroying them when they deal combat damage. That will often result in your opponent having to build up into an alpha strike, during which you can take charge either in the air or through your extort. The removal suite for Orzhov Oppression wasn’t great, but Orzhov Power makes it positively look like Feast of Flesh! A pair of Fatal Fumes give one creature -4/-2 at instant speed, and a six-mana Assassin’s Strike can destroy any one target creature. When your Ubul Sar Gatekeepers start to look less like a bonus and more like a core component, you know you’re in trouble. There’s also Profit // Loss, which can either pump your creatures or give your opponent’s ones -1/-1. From there, the deck largely seems concerned with gaining life, joining it with other ancillary abilities in the form of a quartet of cards. Want lifegain on a conditional Fog? Riot Control is for you. Want a Tormod’s Crypt effect to hammer your opponent’s graveyard… with some lifegain? Voila, Crypt Incursion! Want an aura that lets you syphon some life? There’s a Dying Wish for that. 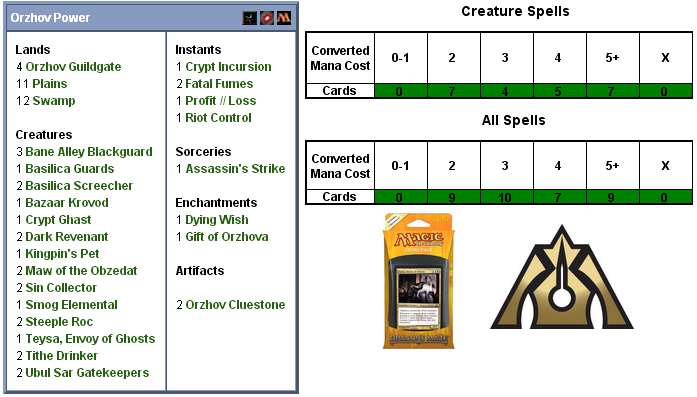 Finally, Gift of Orzhova gives a creature +1/+1, flying… and lifelink. Like the other decks in the series, this one carries a pair of Orzhov Cluestones for added mana fixing. Unlike some of the other decks, the mana-hungry Orzhov are more than happy for the help, since it can assist in fueling large extort triggers off of the deck’s spells. With a lot of expensive cards in the deck, Orzhov Power can use all the aid it can get. We’ll take the deck into battle, and return in two days’ time to render a final verdict. See you then! I understand that extort requires lots of mana to function properly, but 27 (!) lands, a Crypt Ghast and two Orzhov Cluestones is a little excessive, even for an intro deck. Combine this with the lack of decent removal and the Orzhov will have a very meagre early game. This might not be that much of an issue given the slower environment, but it’s not very exciting. I think this will be the best premade deck of the set. 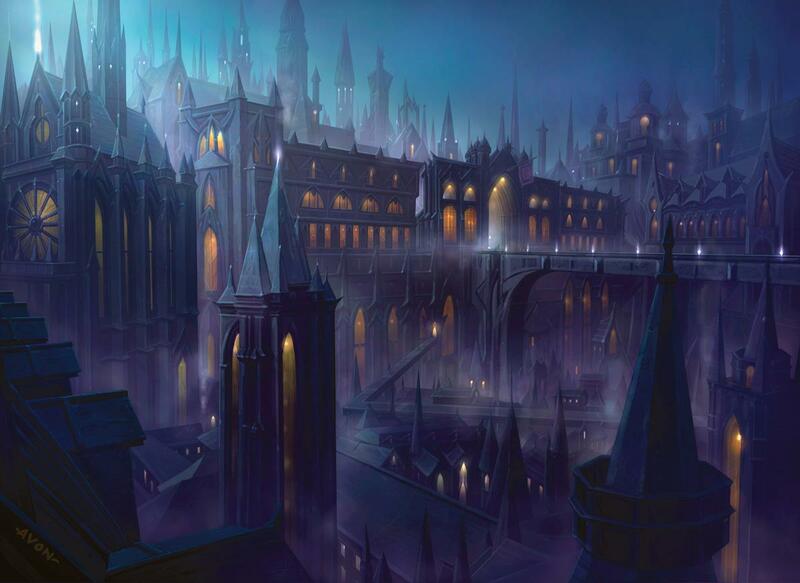 Teysa will absolutely rock the Precon environment here, and all the focus on both Extort and lifegain may be more than the other decks in this gauntlet can handle. Overall, I think this deck will be able to fight through it’s poor removal suite on the back of some true powerhouses and an excessive amount of lifegain.